youtube reinstates wesawthat... youtube channel! 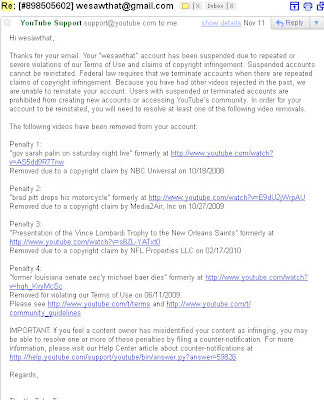 two years ago this coming february, our youtube channel was "terminated" due to several copyright claims and the claim that broke the camel's back so to speak, was the one filed by the national football league through their nfl properties llc against our posting of the awarding of the vince lombardi trophy to the new orleans saints immediately after their winning super bowl xliv clip. we promptly contacted the national football league attempting to make things right. we asked that they reverse their copyright claim so that we could get our account restored and at that we would delete our clip(s) that offended them. the nfl's lawyer laughed in our face. so we assumed that our account and its over 3 million views of nearly 1,000 video clips (at least one making international news) were lost forever. one day a couple of months ago, out of the blue, we received an email from youtube soliciting us to "monetize" our youtube account. we promptly wrote back asking what gives? as our account had been terminated. youtube support responded with the below email that set forth the copyright penalty-strikes against our account and that we needed to get at least one removed in order for our account to be reinstated. "former louisiana senate sec'y michael baer dies"
a community guidelines penalty-strike and not a copyright penalty-strike -- was obviously in error as it is merely a news report on the death of a prominent louisiana politician. currently, when you file a copyright counterclaim, the claimant has ten days upon receipt of the counterclaim to file a federal complaint against you to stop the counterclaim. 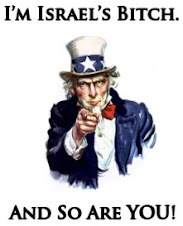 copyright counterclaims filed on youtube at least, you are given a box to type in a message to the claimant. in each counterclaim we stated that while we believed that our posting of the clip was pursuant to the "fair use" exemption to the copyright law -- to please allow our counterclaim to go through so that we could get our youtube channel back and in return that we would delete their video. which we promptly did this morning first thing after receiving our reinstatement email from youtube. we believe that the federal rules of civil procedure, allow federal complainants to serve their complaints via certified postal mail, so you can imagine that everyday for the past few weeks when the mail would come was a very anxious time for us. so thank you nfl properties, llc. 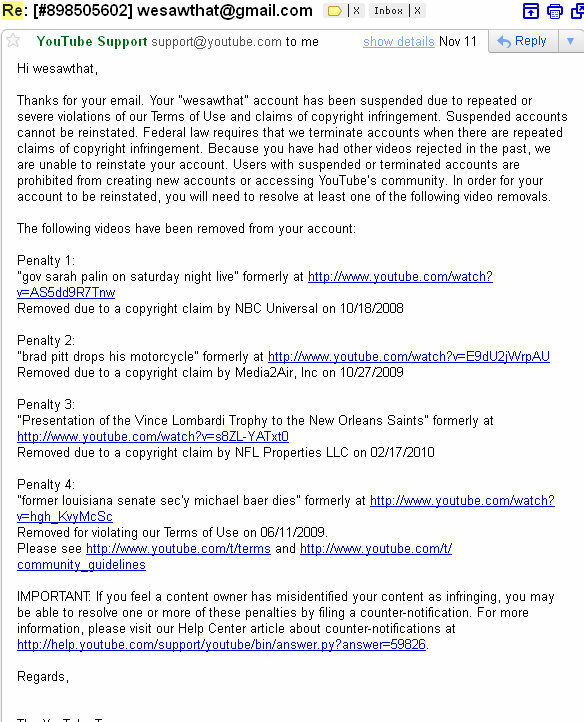 ; nbc universal and media2air inc., for not suing us and thank you youtube for reinstating our channel. time to dump suddenlink internet access? "ode to the welfare state"
is pepper spray a conservative value? subliminal message in the tv show "sliders"
counting crows "a long december"